It started with a cheesecake recipe that went wrong. I had to toss the entire thing in the trash because it didn’t cook all the way through. That was after I cleaned up a river of overflowing water from my toilet. All in one night: ruined cheesecake and toilet overflow. A crappy evening doesn’t begin to describe it. The next day I needed to redeem my baking attempt from the cheesecake disaster. I made devil food’s cup cakes from a box mix. After failing on the cheesecake front, I went for an easy win with the box mix. The cupcakes were easy so I decided to try a new butter cream recipe. I went with “That’s the best frosting I ever had,” from TastyKitchen.com. It’s a simple recipe and requires few ingredients. The fewest for a butter cream that I’ve ever made. The frosting is light and delicious. It’s not the best frosting I’ve ever had, but it’s tremendous and quick to make. I’d rank it in the top 5 recipes, maybe higher. 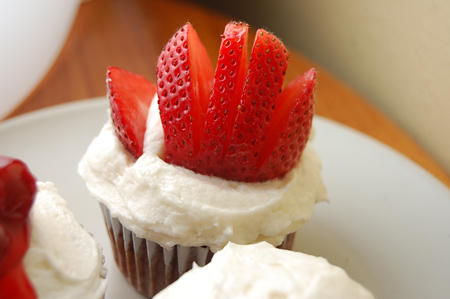 We had fresh strawberries for dinner so they were just sitting out begging to be put on top of one of these creations. And, I had a can of cherry pie filling that I was supposed to use on that cheesecake from last night. It was just sitting there waiting for a reason to go on some dessert. Let me tell you … this is happiness on a plate right here. 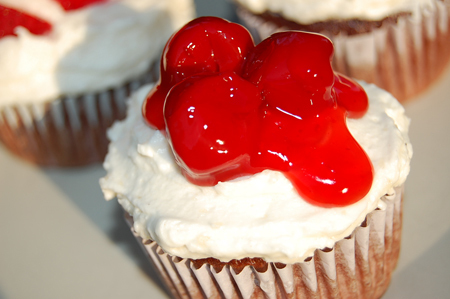 The flavors of the cherries, the butter cream and the devil’s food cake are an amazing combination. I think I might go eat another one of these after I finish this post. I made my kids suffer because I had them wait to eat a cupcake while I took photos of these babies. I thought for sure they would go for one with the cherries or strawberry on top. Nope, both of them grabbed a plain one. Doesn’t matter, they are all delish! Yum! These look amazing. Wish I was there.